Kindergarten students improve comprehension by listening to read-alouds. Kindergarten marks the beginning of your child's first formal year of reading instruction. If he already knows letter names and a few sounds, he will have an advantage because these are foundational reading skills. Kindergarten teachers build on these abilities and then progress to comprehension strategies. By the end of the school year, your child should be able to read grade-level books with fluency and understanding. Before your child can read, she must be able to decode (sound out) words. Kindergarten teachers use phonics instruction to introduce letters, one by one, along with their corresponding sounds. 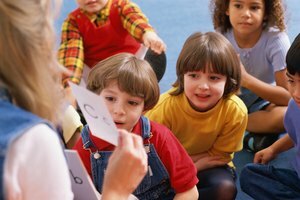 The goal is for children to have phonemic awareness – the knowledge that each letter represents an individual sound. Once children understand this principle, teachers will practice decoding with CVC (consonant, vowel, consonant) words with them. Your child will begin reading simple books that contain many of these words. Context clues help your child comprehend what he's reading and improve his vocabulary at the same time. Your child's kindergarten teacher will demonstrate how to use this strategy. The teacher will pause at a word as he or she reads and pretend not to be able to decode it. For example, the teacher encounters the word "bird," a complex word for kindergartners because of the "ir" sound in the middle. After pronouncing the first sound in the word ("b"), the teacher points to the picture of birds on the page and then asks the children to say the word. Since most students will know the initial sound ("b"), determining the word becomes easier especially if the book is about birds. Kindergarten teachers rely on shared reading to help their students improve reading fluency and learn concepts of print – like left-to-right progression of words and sentence structure. Echo reading is a shared reading strategy. For example, the teacher reads a sentence from a book. The students will repeat the sentence while the teacher points to the words. When your child participates in this activity, she will also improve her sight word vocabulary. These are frequently used words that usually cannot be sounded out like "what," "the" and "come." Guided reading is a strategy teachers use to help their students in small groups. This allows teachers to differentiate instruction to meet individual needs. 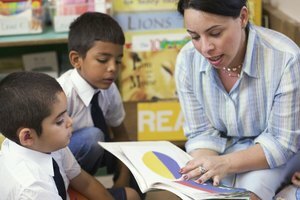 If your child is an advanced, average or struggling reader, the teacher will use specific techniques in guided reading groups to help him. The teacher will reinforce decoding and comprehension skills using books that are leveled in complexity. This method allows every child to experience success in reading. Hollowell, Karen. "List of Reading Strategies Taught in Kindergarten." Synonym, https://classroom.synonym.com/list-reading-strategies-taught-kindergarten-4951.html. 26 September 2017.